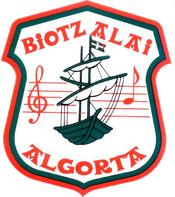 The Biotz Alai was created in 1923 as a parochial church choir linked to the parish of “San Nicolas de Bari” in Algorta (Getxo). Its first conductor was D. Manuel Gainza, and some time later D. Angel de Urigüen took over from him. - First prize in the Male Voice Choirs section at the International Competition in Tolosa (Basque Country). Year 1969. - First prize in the Concurso de Habaneras (sea-faring song contest) in Torrevieja (Spain). Year 1970. - First prize at the Polyphony Competition, also in Torrevieja (Spain). Year 1972. - Sucessful performances at the Llangollen Festival (Wales), both in 1972 and 1973. - First prize in the competition “Voces de Euskadi” (Voices from the Basque Country) at the last competition held in 1979, attended by all the male voice choirs of the region. - Performances in cities all over Spain, including concerts at the “Palau de la Música” in Barcelona in 1978 and again in 1981, in the Cathedral and University of Gijón, at the University of Salamanca, as well as appearances on Spanish, French and Basque TV (Euskal Telebista). - Several tours in Germany, Holland, Belgium, England, Wales and France. - From 1982 to 1985, several concerts with the Orquesta Sinfónica de Bilbao (Bilbao Symphony Orchestra) performing L. Cherubini’s Requiem in D.Minor. - Tour of Czechoslovakia with performances in Prague, Lidice, Moravia and Ostrava. Year 1984. - Appearance as a guest performer at the International Competition in Gorizzia (Italy) in 1984. - First prize/ gold medal for male voices at the International Competition of Neufchatel (Switzerland), with choirs competing from all over the world. Year 1985. - Highly successful tour of Portugal in 1987 performing in Casçais and Lisbon, and appearance as guest performer at the third “Certamen de Habaneras” (sea-faring songs) in La Coruña (Spain). Year 1987. - Tour of Venezuela in 1989, including performances in several Venezuelan cities, with 30 pieces recorded for a Venezuelan TV Channel. - Tours of the Canary Islands and Galicia in 1990 and 1991, including (and worth a special mention) the Mass by Goikoetxea (a Basque composer) sung in the Cathedral of Santiago de Compostela. - Tour of Argentina in 1993, performing at various theatres and auditoriums in Buenos Aires and Mar de Plata, including a recording for Euskal Telebista (Basque TV). - Successful performance at the first Convivial Song Festival in Pecs (Hungary), 1996, performing several concerts during the course of this festival. In 1998 the choir celebrated its 75th anniversary, receiving a tribute from the Asociación Vizcaina de Coros (The Choral Association of Bizkaia), and giving guest performances at the Teatro Arriaga (Bilbao), the auditorium of the Guggenheim Museum (Bilbao), and the Palacio Euskalduna (Bilbao’s Opera House), as well as at the headquarters of Athletic Club of Bilbao (Bilbao’s main football team), alongside with the soprano Ainhoa Arteta, as part of the club’s centenary celebrations. In the year 2000, the choir travelled to the Lanzarote in the Canary Islands, invited by the Cabildo Insular (The Local Government), and gave concerts at the natural auditorium of “Los Jameos del Agua” as well in the city of Arrecife. Born in Tolosa (Guipúzcoa), he took Music Studies with Felipe Gorriti and later on with Eduardo Mokoroa at the Music Academy in San Sebastian, where he obtained a scholarship to broaden his knowledge. He was a Conductor of Music Bands and conducted the ones in Sestao, Gorliz, Gernika and Getxo, the latest up until his death in 1943. In Sestao, in 1906 and 1907 he simultaneously conducted the Band, played the organ in his Parish Church and also conducted the Choral Societies named “Trabajo y Cultura” (Work and Culture) and the extinct “Sociedad Coral de Portugalete” (Portugalete Choral Society). Once in Getxo, where since 1919 he was in charge of the Municipal Music Band, he founded the “Sociedad Coral de Guecho” (Choral Society of Guecho), afterwards called “Coro Biotz Alai” (Biotz Alai Choir). In spite of being very fond of choirs, amongst his compositions for txistu (typical Basque type of recorder), band and orchestra, there are no choral works. Born in Durango, he followed his religious vocation and when assigned at the Parish Church of San Nicolás de Bari in Algorta, he was in charge of playing the organ. Along with some male members of the Choral Society of Guecho, he re-structured the choir of male voices, changing it into a mixed choir. Under his direction, its name was then changed to “Coro Biotz Alai”, which still remains. Not only the choir met the musical needs of the Parish Church but also it held several concerts within the town, in some of which they sang along with the Municipal Music Band. Born in Getxo, he is the son of the founder of the“Sociedad Coral de Guecho”, predecessor of the actual Coro Biotz Alai. His father wanted him to follow his path so he took Music Studies with him: solmization, piano, harmony, counterpoint, instrumentation, etc. The early death of his mentor forced him to change direction, but in 1966, caught up in his musical roots, he re-founded the Biotz Alai Choir as a male voice choir once again. He conducted it until 1988 when, due to health reasons, he had to pass the baton over to Javier Oyarzabal. Under Juan José Gainza’s direction the choir obtained great success not only in the whole country but also abroad, becoming winner of numerous choral contests and obtaining big awards in shows and festivals throughout Europe. Born in Algorta (Getxo) on 3rd December 1962 to a family with deep musical tradition. He was led to the world of music by his mother, a highly qualified pianist, he started his musical studies at Conservatorio Vizcaino de Música “Juan Crisóstomo Arriaga” at 6, studying solfege, piano, guitar, harmony, with outsanding qualifications. In 1983, when he was 21, after a brief lapse, owing to his engineering studies, he resumed his musical career, this time materialized through his many piano concerts, having accompanied great voices of his native land like Santos Ariño, Jose Antonio Urdiain, to name a few. He joined the choir Biotz-Alai in 1980, as a vocalist member, and became its conductor in 1988 taking over from the former one D. Juan José Gainza, who had been its conductor since 1966. Born in Orduna (Bizkay) in 1948. He has an extense musical education, having studied solfa, piano, harmony, composition, conductorship, organ, etc at different music schools in Spain, France and Hungary, obtaining excellent marks. He has worked intensely as accompanying organist with the Bilbao and Seville Symphonies, the Bilbao Chamber as well as with choirs such as the Bilbao Choir, Renteria’s Andra Mari, the Bilbao Opera Choir, the San Anton Choir, etc. He has performed as solo organist at many festivals in Spain: in Burgos, at Seville’s Holy Week, in Jerez de la Frontera, Osuna, at Bilbao’s Sacral Week, in Segovia, at Lekeitio’s International festival, etc. As a composer he has written piano, organ, choir, txistu (Basque flute) as well as various Chamber formation pieces. He is founder of the Ars Viva Choir, the Our Lady of Begona Escolania, the Kamara Orphee and the Lamindao group, etc. He has conducted several choir groups and was the Biotz Alai Choir conductor since 2009 to 2015. Conducted the choir from september 2015 to december 2015.